In the center of the summer, we (those of us who live in most climates that are currently experiencing summer right now) like to spend as much time as possible outside. We’ve gone over patio coolers recently in one of our guides, and some other fantastic things we’ve thrown together to complete your background experience. If you’re keen on the camping or rugged experience, then you’ve considered many ways (some we will pretend you didn’t consider for the sake of city bylaws) to add fire in an awesome way to your patio game. There are a few things that truly spice up a backyard jam like fire does, and that is fake or simulated fire. To be truthful, plenty of these options can be used indoors too, but there isn’t usually a need for flame-born vibes indoors. It’s a beautifully tranquil experience, enjoying delicious foods and liquids out in the open air with some of your favorite people (or no one), next to the flicker of a flame. We’ve gathered some of the best options for a discounted joy, or a premium tabletop fire pit experience that will change the way you gather round for a very long time. Can’t decide between a fire pit and a table? Opt for both with this festive and fantastic fire pit table. The tempered glass means you’ll never need to worry about cracking or overheating, nor will you need to worry about a metal top that stays hot for hours after the fire’s burned. You’ll be the hottest thing about this fire pit, which makes a romantic and beautiful atmosphere no matter what climate you’re in. The wicker and aluminum base is sleek and sturdy, and you’ll love how thoroughly it elevates your outdoor living space. While many table top fire pits and fire pit tables will likely include this feature, it’s a rare joy when they improve the look of the table. So many times you compromise your beauty for something safe or secure. That’s not the case with this fire pit table. The wind screen is reflective. As one reviewer pointed out, this makes for a dramatic fire reflection. Even if you have a small fire going you’ll find that the reflection makes it bigger and better than your wildest, hottest dreams. One of the fears people typically have with fire pits (and especially table top fire pits) is the fact that no matter what surface you put it on, there’s a risk of destruction. Either you light the grandparents’ wooden, antique table on fire, or you warp the plastic of your cheap patio furniture. You’ll never have to worry about the integrity of your table when you purchase this combination table and fire pit. The tempered glass will hold strong in all weather conditions, faced with any heat that fire gives off. Considering the fact that you’re not only getting a fire pit, but you’re also getting a sturdy patio table, we believe that the $550 price tag is totally fair. The durability of this product is unparalleled, and there’s no way you’ll be disappointed with it when sitting around its flickering flames, sipping wine and eating 7-layer dip. The joy you receive from this product can hardly have a price put on it. $550 is pretty reasonable when you think about it in terms of joy. In a stark contrast to the fire pit and table combination we read about above, we bring you Regal Flame’s model of a tabletop fire pit. Rather than being built into the table, this is a fire pit that you’ll be able to shift depending on where you want it. While we wouldn’t recommend moving it while it’s on, you can indeed shift it around to suit where you want the heat and the style. 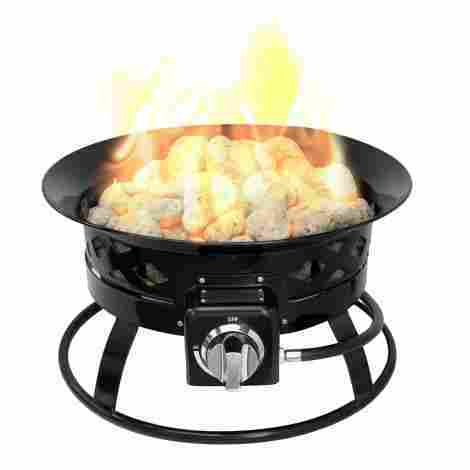 Regal Flame truly knows their fire, as this product is far and away a great, portable fire pit. Some fire pits that you might have seen probably burned with a gas or oil that released fumes. Luckily, this fire pit uses ethanol-based fuel to create a flame. This means that the fire pit doesn't have any vents, and doesn't even need them! When you’re looking for ease, not needing to worry about ventilation truly helps. Just make sure it’s filled and you’re good to go! Small apartment dwellers, rejoice. We get that it’s hard to heat a tiny apartment. You don’t want to justify spending so much on hydro, even though you know you’ll be unhappy without a warm and cozy home. With this table top fire pit you’ll now be able to save a little something for those rainy days, rather than spending it all on the cold ones. The heat that this little table top fire pit gives off is more than enough to warm a small apartment. You’ll find that you’ll need to turn the heat on less and less, ultimately saving you a little money in the long run. Judging from the last paragraph, you probably know what you’re going to say. This fire pit is absolutely a great value for its cost, as it will (in the long run) save you money. When you realize that you no longer need other heating tools to make your room or apartment livable, you’ll fall in love with this sturdy and safe fire pit all over again. While it doesn't come with as many extras as some of the other fire pits on our list, the cost of this product is money well spent. We’ve seen sleek tabletop fire pits and we’ve seen subtle ones. We’ve seen tables that house full fires and we’ve seen open propane tanks hanging off of patio tables. What we haven’t seen is a more rustically-styled look. This is the niche that Sunward’s portable fire pit fills. The lava rocks make it look more outdoorsy and casual, and less like a classy, contemporary sculpture. The whole fire pit has a campfire vibe, which will be perfect for those backyard camping adventures. Yes, this is portable. Yes, it does run off of propane. It’s not magic that makes it work, even though that sounds like it might be the case. However, due to the propane tank capabilities, we’re willing to be that you’ll want to keep this baby outdoors. What do you do when the weather turns against you, though? You pull out the weather resistant cover you got with your Sunward fire pit and you rest easy, knowing that this little flame-maker is safe. While you might have heard about burn time in crime shows related to the speed or traveling distance of a fire, this one is a little more straightforward. The burn time for most fire pits is a selling point simply because people want to know how often they’ll have to refill their tanks. 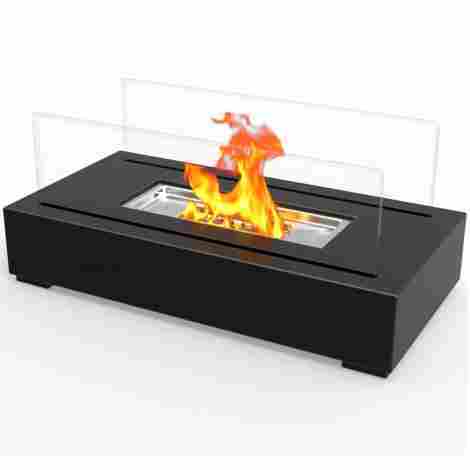 Luckily for you, this tabletop fire pit gets a full 24 hrs of burn time on one 5 gallon tank. This is a huge amount of time when you consider the fact that it won’t be on for 24 hours consistently. If you used it for 45 minutes a day, you’d have a whole month’s worth of night time relaxes by the fire. For your money, you're getting a solid, sturdy product that isn't going to disappoint. The base, the rocks, and the flames are all going to impress you with their longevity and their sturdiness. The durability is huge when it comes to an outdoor fire pit, and this certainly doesn't disappoint. 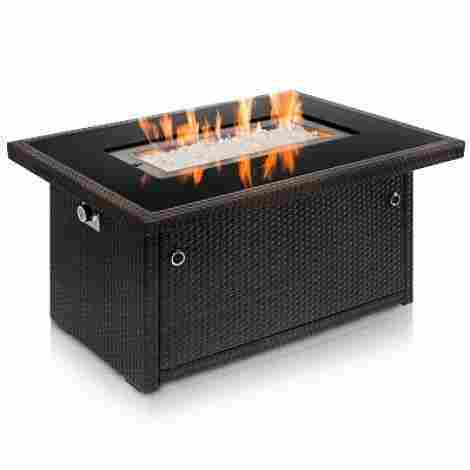 We believe that this is a tabletop fire pit you’ll definitely be happy with, even with the slightly higher price tag. Bond: James Bond is not the hero in this story. 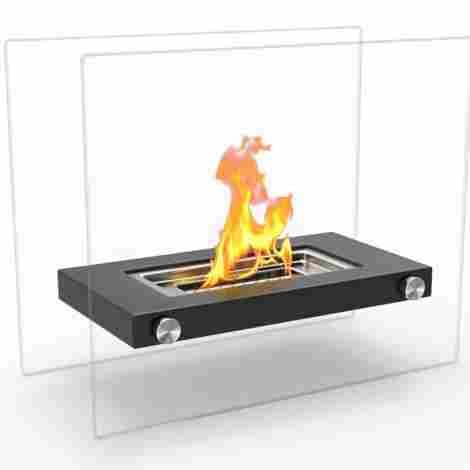 Our hero this time around is the Bond Company’s table fire pit, a product which will definitely light your fires of passion for table top flame. The fire pit itself is a beautiful construction, with the versatility of fitting any patio table that has an umbrella hole. This means that no matter what type of outdoor situation you’re in, you’ll be able to give this firepit a loving home… All you need is a hole, some propane, and determination. Let’s face it: if there’s a tricky installation process, you’re less likely to use a product. You want to be sure that you won’t be wasting precious hours toiling over hooking up a fire pit that you’re not really sure you’ll use all the time anyway. With this fire pit that’s not the case. You don’t need to worry about whether or not you use it all the time, because you aren't going to be wasting any time on set-up. All you need to do is place it over your table’s umbrella hole, attach it to the tank, and turn it on. It’s so easy to install that you’ll be pleased you decided on purchasing this fire pit rather than any other one. This is an important quality for fire pits without windshields to have. While you don’t need to worry about the wind blowing the flames out, you do need to worry about the wind throwing the flames around. For those with long hair, you know how stressful it can be to try and protect yourself from leaning over and starting an accidental date-night candle fire. Imagine that (but ten times worse) when you’re trying to figure out what could happen with an unguarded flame and a lot of wind. With the adjustable intensity of the fire on this pit, however, you’ll never need to worry about things all of a sudden lighting up. Just turn it down a little when the wind picks up! This is a durable and reliable machine that will give you a whole lot of happiness. However, you will need to purchase a patio table with an umbrella hole and a propane tank to make it work. If you already have those things, that makes this a relatively low price for outdoor coziness. If you don’t have either of those things, you’ll find that the price can swing upwards fairly quickly. Just looking at it as the cost compared to the intrinsic value of the fire pit, we do believe that this fire pit is well worth the price tag. Some reports of tanks being unable to attach on. 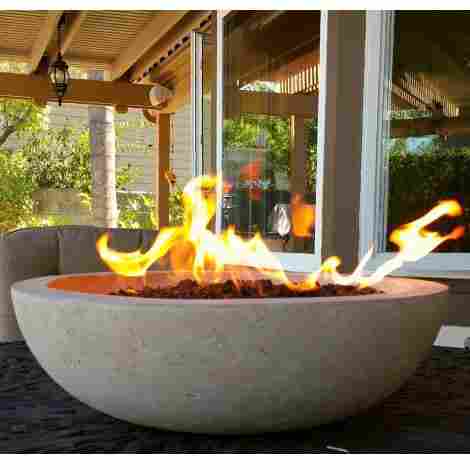 Regal Flame is back with another version of their ventless, indoor/outdoor tabletop fire pit. This time we’re looking at one that will give you flashbacks to science class. The total glass tube coverage is not only safe, but it looks so scientific you’ll almost be able to justify staring at and observing the flames. Plus, the size is just big enough that it’ll still make a statement in a larger room. With all of these positives it’s only natural that you’ll feel tempted by the beauty and poise of this tabletop fire pit. One of the biggest benefits of this fire pit is the fact that it’s a totally protected flame. You’ll still get all the heat you want from it, but you won’t have to worry about anything accidentally getting pushed into the flame. While other fire pits have partially covered flames, this flame is totally and completely enclosed. There’s nothing better than having safety and visual interest in a product, which this product definitely has. This is something that quite a few tabletop fire pits lack, which may or may not be surprising to you. Many aren't able to be moved unless you’re also willing to unhook (and re-hook) the propane tanks back up. This means you’re limited to using your tabletop fire pit outside, even though it might be better suited to an indoor vibe. If you’re going to invest in a product, why limit yourself to only having it indoor or outdoor? With Regal Flame’s portability, you get both. The low price is about average for a small, tabletop fire pit, making this one of the standard models you could purchase. 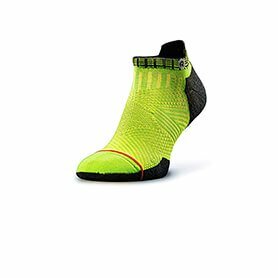 The quality is anything but average, though, even at the low price. You’re getting full protection as well as full flame, and the make is guaranteed to keep going for many fun, fire-filled years. When you picture in your head a table covered with fire, this is probably the image that comes to mind. It’s not as on-the-nose as the first flaming table we looked at, though it will give you a similar effect. This outdoor statement piece looks like a regular table, until you take off the secret lid. This reveals a fire pit that will give you a beautiful, roaring flame reminiscent of those bonfire beach nights we all know and love. The stainless steel lid will also give you a sense of security, knowing that you’re able to contain any flames swiftly and easily. With some of our smaller fire pits, there has been complaints of propane tanks being visible. That’s just what happens when you’re purchasing a tabletop addition. You’re going to have to let something give, and the visibility of the propane tank is usually it. With this tabletop fire pit, you don’t need to worry about seeing the propane tank crowding your style. This table includes a hidden spot for the propane tank. This makes it look just like a regular table, proving that you can have style and functionality all in one. When you’re purchasing a big-ticket item, you want to rest assured that you’re going to be supported if any issues come up. Hiland has a great customer support team. Not only do they give you a whole year of warranty, but they also give you access to replacement parts (guaranteed), repair services, and telephone guidance when fixing your fire pit/outdoor heater. We were surprised when we saw how much this product cost. We couldn't believe that such a beautiful, sturdy, and all-around brilliant product is so affordable. While you do have to put out a little bit of money for the propane, all in all, this product has an excellent value for its cost. It’s always sunny in your apartment, especially when this tabletop fire pit comes into the picture. Not only will it warm your home, it will warm your heart. The Sunnydaze brand builds a great product. 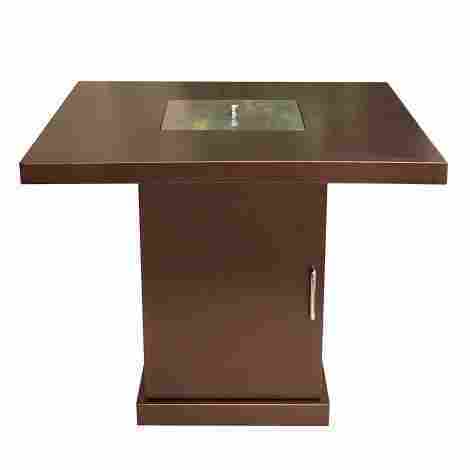 You won’t be be disappointed by this sleek and demure tabletop fire. The copper-finished case is different from the contemporary, darker metal ones we’ve seen, which makes it perfect for those Earth-toned homes. Plus, it gives a little bit of a wood vibe. When purchasing a fire pit, that’s definitely a plus. Scratchy feet on a table top fire pit are all well and good if you’re putting it on the outdoor patio furniture that you got from the your old neighbors. If you’re placing it on Grandma’s antique coffee table, though, you want to make sure you’re being careful of scratches. This fire pit has protective feet, making it easy for you to feel safe moving it around a delicate, pristine surface. Let’s be real for a second: you want a fireplace so you can feel classy, even while living in your basement studio apartment. We get it. You want to be able to feel like a million bucks, even if you don’t live it. 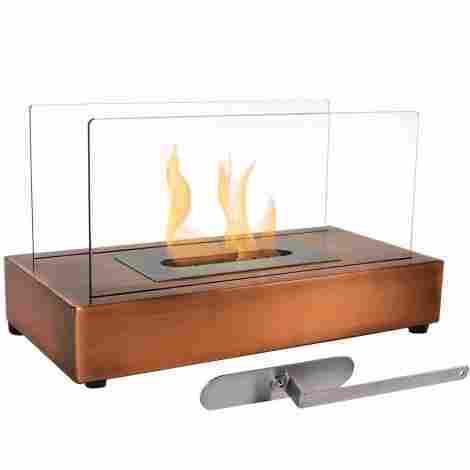 This tabletop fireplace is perfect for that, as the copper and flame reflect to give you a beautiful, elegant feeling. The ambiance this fireplace puts out is one of the best parts of it, as many reviews have said. We think you’ll agree once you plug this copper-plated beauty in. This tabletop fireplace is a little bit in terms of price than some of the other portable ones. While the build is average, it’s absolutely gorgeous enough to warrant the slightly higher price tag. When you get right down to it, the difference isn't much. You’re still going to be purchasing fuel, which will always make the price of these fire pits increase a little in terms of running costs. We love this look, though, and would definitely recommend it at the price just for that. This is probably what you were thinking of when you saw the title “tabletop fire pit”. Many people don’t realize that fire pits can have a contemporary look, like some of the other options on this list. This is the classic fire pit, with a standard bowl and rock filling. The flames are high and hot, and you might get a little worried when seating little hands and young minds around the open fire pit. Without a safety screen, though, you’re able to really, truly appreciate the fire. It looks so good it’s almost better to not have it. If there’s one type of fuel we know how to buy, it’s propane. Propane will heat up quickly, making it easy to turn on and use with just one twist of a knob. You already know how a propane tank works, which means you’re easily able to troubleshoot any issues that come up. Plus, it’s a little cheaper than some other specialty fuels. All in all, this is truly one of the top reasons to invest in this fire pit. It’s a silly thing to say, but it’s true! When you’re wanting a fire pit, you don’t want something that’s going to stay hot for hours later. Even with flames being turned off, the risk of burns from a hot base is just too high. Bases that retain heat are only good for tea pots; not fire pits. This is why we mention the fact that the bowl is well insulated. Reviewers have said that even when the flames are on, the base doesn't get too hot. Now you’ll never need to worry about innocent fingers touching a hot, post-flame fire pit base. The base is way too thick and well-insulated to hurt. It can only be used outside, and it requires a propane tank in order to run. While it feels a little expensive for what it is, we actually believe that it’s right on the money. The durability and safety of this fire pit will truly last you forever. You won’t need to purchase fuel as often as some of the other smaller fire pits, which means you don’t have the same sort of running costs. The price is definitely worth the pit; it’s just a matter of whether you want something that will last you a lifetime or not! Regal Flame does it again with a beautiful, vent-less fire pit. This tabletop construction means you can place it on the dinner table or in the bedroom. It fits outside as well as inside, and there’s no risk of needing a lot of ventilation to make it safe. The ethanol burn is clean, and you’re going to find that you’ll start to love the look of this tabletop fire pit even more than a traditional centrepiece. It’s just so mesmerizing to watch the flames dance! The solid base of this fire pit makes it one of the best for any contemporary home designs. The style of it is beautiful and strong, with a subtle boldness that makes it possible to both stand out and blend in to a truly contemporary home. The color block style of base makes it possible for you to find a color that will integrate into any decoration or theme in your home. Sometimes you don’t want to make a big deal over the fact that you have a fire burning in the middle of your dinner or patio table. You want a subtle, almost candle-like quality, which is partially where the value of this tabletop fire pit lies. You never have to worry about visitors staying longer than you want them to with this fire pit. The flame burns small, bright, and only for a couple hours. This makes it easy to send the subtle gesture to guests that the dinner party is over. Want to extend the life of the party? Easily refill and the flame will start glowing again. This is definitely an average tabletop fire pit, but we’re not upset. We love the way that it looks and feels, even if it’s not everyone’s cup of tea. The contemporary style always looks a little more expensive, making this fire pit certainly look better than average. We love the visual of this fire pit, which is the cherry on top of the whole situation. Regal Flame’s credibility and quality is far and away enough reason to purchase this piece. We’ve finally come to our final option on this list of amazing tabletop fire pits and fireplaces. 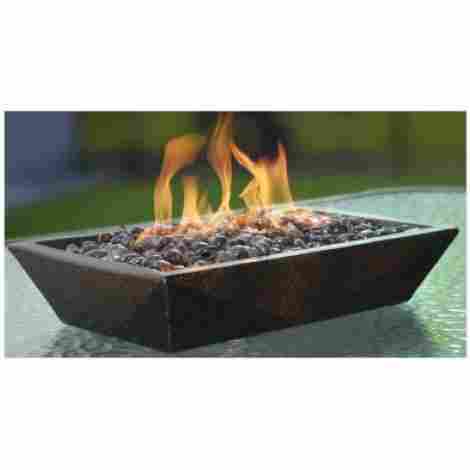 Regal Flame has made an appearance a couple of times on this list, making it truly one of the most popular brands to purchase tabletop fire pits from. We love it for many reasons, and we’re willing to be that you’ll love it too just based on the few you’ve read about so far. This reliable, quality product won’t be a disappointment no matter what style you choose. We had to mention this just because it’s so cool. While most fire pits are the classic base-or-bowl-containing-fire, this one has a weird twist. The portion that holds the fire itself is suspended between the tempered glass sheets. This makes for a mind-boggling design that looks so incredibly cool from across the room. There’s a lot to be said for brand loyalty. While some people think it’s silly, we certainly believe there’s a time and a place for being loyal to brands. Brands that do something well deserve the praise and following they get, and often have the quality and warranty to back it up. That’s the case with Regal Flame. You know that you’re going to be getting the best quality and branding out there when you purchase one of their products. Once again we have to reiterate that the brand was a big deciding factor for us choosing this product. The value is absolutely worth the cost, as the other choices prove. This design is no different from any of the other tabletop fire pit brands: the quality is high, the burn is bright, and the brand is there when there’s any issues or sticky situations. It’s absolutely worth the average price. We hope that we’ve given you a comprehensive guide to some of the best fire pits out there right now. Whether you’re looking for something that rests on the tabletop or something that’s fully built into the table, you’re going to be happy with your choice. Following this buying guide means being able to rest assured that the quality, longevity, and reputability is already vetted for you. We know what you want in a fire pit, and we’ve done our best to identify which ones are hot, and which ones are but a brief flicker in our hearts. You could start evaluating the make and materials of the common market for tabletop fire pits at any of their corners. It doesn’t matter if you’re inspecting the heat-resistance glass that keeps the fire on the inside, or if you’re hoping that you’re getting a good deal on quality metals that won’t bow or warp, there’s a lot of little parts involved here. The build of these tabletop fire pits isn’t always that simple, and often include many moving parts like propane tanks, intricate tubing, and multiple different options for types of burning. One thing that could easily be graded is the specifics in the building materials. Especially an ethanol burn. 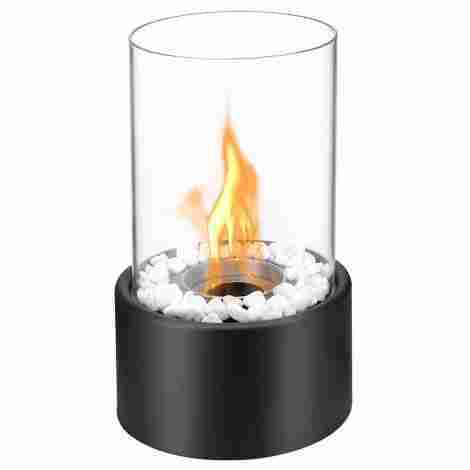 Most fire pits or fueled candles of any sort burn ethanol, as it is a cheap flammable with a solution mostly consisting of alcohol, and that is and should always be considered as an example of value. Not to say that only the cheap guys will burn ethanol, but rather, understanding where your target is will help you weed out specific hit or misses in the product description. The true mark of a good value for most fires is that it’s real, and puts off heat. There isn’t a ton of differences between most of these tabletop fire pits when you write down all of the combinations and materials on paper, but everything single one of these builds and final products is very different than one another. On our list — and on the rest of the marketplace worldwide — you will find a ton of variety in aesthetic and a ton of varied additional fun bits of builds. Shapes are a big point of variety in the design and construction of these smaller fire pits and you’d be flabbergasted at some of the eccentric shapes in metals, and glass that are out there. It’s true, we went a little boring when it came to our choices, but we like to think of it as aiming for something modest and chic instead of artsy or too retro. After all, we put together this list to show you the best products in a wide market, not to sell you a craft beer flight with six shots of poorly named darks taped to a paddle-board next to a deconstructed grilled cheese sandwich. We were practical and intent with our choice to focus on the minimal and wondrous. 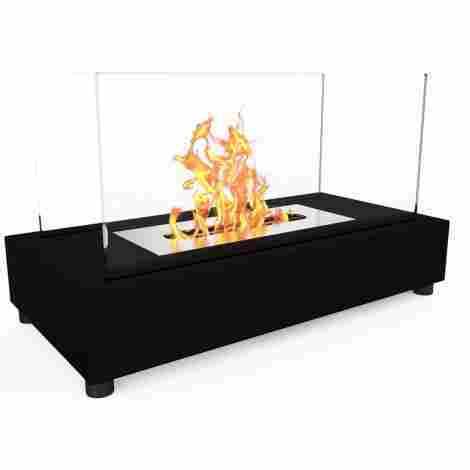 But, the largest of all the choices when it comes to the tabletop fire pit is the type of fire you’re looking for. Whether or not you’re looking for one of those flickering paper cutouts of a fire that blows in the find of a fan, an oil burning contained fire, a gas burning fire, or even a wood burning one, the fire itself is the most important decision you can make when looking to purchase one of these fine flame bringing portals. We attempted to look at all sorts, and pluck the best of the bunch. As with every market, there’s a median price for a generally everything. And fire pits that sit atop your table do not skirt around that worldwide rule. Ultimately, it’s up to you to decide what kind of budget you have going into this shopping experience, and there’s no real wiggle room on that. Set your bottom and top, and hit something within that. There are too many options, with all sorts of varied designs and makes out there, one of them is going to be for you. Q: What does it burn? A: That’s a fantastic question. There are only a handful of options in the case of what your tabletop fire pit is burning, and it is easily discovered in both the titles of the products, and the descriptions. The options are basically boiled down to (and take this as a brash generalization void of all scientific specifications) options that include nothing, as in, fake fires, oil-based burning foundations, gas burning options, and even wood burning variations are out there. A: Well, almost everything on the market is real fire, so it does get hot. While there are some options out there that don’t include the ability to sustain real burning fires, the ones that do will get pretty hot. At least, on the inside. Part of the designs around town are built to keep the heat in, mostly in a safe way. Again, in most of the product descriptions, you will see a clear indication of the heat that the fire pit can produce, as this is often the reason people are buying the fire pits in the first place. A little bit of extra heat here and there with some beautiful flames to look at can really make a difference. A: Many of the products we listed can be used both indoors and outdoors. As a consumer, you should ensure that the product specifies outdoor only or indoor only prior to purchasing it. Just in case there is some discourse, rain or water is bad for fire, therefore, if you’re intending to take one of these fire pits outside, it would be best to keep it under a shelter from the possible rain. Indoors, you’re going to want to avoid using the propane options — as it is very much warned against — but you can bring almost all of these fires, real or otherwise inside or outside depending on where you want it to be.